My post from last year about The 39 Clues series and The Maze of Bones (Book One) is one of the most highly frequented posts on Brimful Curiosities. That's not entirely surprising considering the popularity of the unique middle grade series. The books follow two orphans, Dan and Amy, as they race against other branches of their family to discover and assemble 39 clues hidden around the world. In anticipation of the upcoming release of the final book, Into the Gauntlet by Margaret Peterson Haddix, the authors of the books in the series are participating in The 39 Clues blog tour, and Brimful Curiosities is the second stop of the tour. When Book 2: One False Note came out, my eldest son Jay was a fourth-grader, which couldn’t have been more perfect. Here I was, working on The 39 Clues series, and I was living with a member of my own audience. 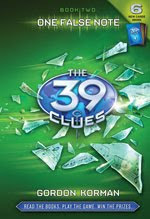 Book 1: The Maze of Bones got Jay hooked, and after that, we moved straight to The 39 Clues website. There are four branches in the Cahill family and I’m a member of the Janus branch. This makes sense, since I work in the arts, and since One False Note focused on Mozart, a famous Janus. Maybe it’s a dad thing – wanting your son to follow in your footsteps. For some crazy reason, I assumed that Jay would end up a Janus like me. But when he took the quiz, the mysterious branch-assignment oracle had placed him with the Lucians. Now, none of the Cahill branches get along very well, but the Lucians and the Janus seem to be especially hostile to one another. In the spirit of healing, I offered Jay access to the Janus secret documents on the site, expecting – reasonably – that he’d do the same for me. Uh-uh. When he’s on The 39 Clues website, I’m not even allowed in the room! It’s incredible to me that a fantasy-adventure series I’m helping to write has somehow managed to create a cold war right smack dab in the middle of my own family. Even more amazing is the amount of information that has gotten through to Jay “under the radar” as a result of his interest in the series. My son – who up until recently believed that World Wrestling Entertainment was the ultimate in culture and sophistication – regularly spouts facts about Ben Franklin, Mozart, and the Russian royal family. The other day, I overheard him lecturing his siblings that the continent of Australia is home to more creatures that can kill you than any other place on earth. The Australian tourist bureau may not be as effusive in its expression of gratitude, but as a parent, I love it that my son has opened his eyes to the vast cultural richness of the world around him. Better yet, he sees that a lot of it is – as Dan Cahill (or Jay himself) might put it – mad awesome. From my kids’ perspective, I’ve been a writer forever. But it certainly isn’t lost on them that the things I do in conjunction with The 39 Clues always seem to be just a little bit … well, cooler. Whether it’s opening the NASDAQ Stock Exchange, or being interviewed by Whoopi Goldberg or on ABC World News Tonight, the work/play line continues to blur with this series. It’s been a fabulous ride, not just for me, but for my entire family. Maybe that’s the real reason this series has been such a wonderfully rewarding experience, above and beyond. 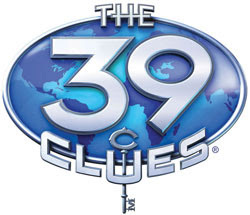 I’m not just a 39 Clues author; I’m a 39 Clues parent, too. • Contest ends on Tuesday, August 31st, 2010 at 11:59 PM CST. July 23: Techmamas; July 27: Brimful Curiosities; July 30: Susan Heim on Parenting; August 4: Manic Mommies; August 9: HighTechDad; August 12: Tree, Root, and Twig; August 18: The Children's Book Review; August 23: Robyn's Online World; August 25: On Our Minds @Scholastic; August 31: 5 Minutes for Mom. I would feature Helen Keller. I think my two boys would enjoy reading these books. Thanks. How about the Pilgrims or Jesus? I am considering getting these books for my son so I would love to sin these to see if he likes them. Historical figure ... How about Leonardo DaVinci? I'd like to feature ... Helen Keller, perhaps ... or John Muir ... or Dorthea Lange. Yes, wildly eccentric choices, I know! I've RT'd this on Twitter (already a follower). And I just signed up as a follower on your blog. Love the guest post - great! My son loves adventure stories and is VERY into history - especially the Civil War and Revolutionary War eras. So on his behalf I would want to feature Abe Lincoln. I love finding a series that will hold my son's interest. These look great! Thanks for the giveaway. I'd like to win these books for my daughter who loves to read. I would feature Henry VIII! I am a parent to a child who loves these, and I have to say that I have read them all myself. I am looking forward to the next book. I think I would feature Lewis and Clark (and Sacajawea ) in one. I would love to have these books for my tween. for a historical figure, I would choose Amelia Earhart. I don't know who I'd include, but I guess I'd figured these might be beyond a First Grade reading level. Seeing that at least some 1st Graders can handle it, I think these would be perfect for my daughter. She's into mystery stories and would love a change of pace from the normal mysteries targeted at her age group. These books look so cute! I'd love to win! I think I'd include Agatha Christie. My kids and I read books before bed every night and I'm always looking for new ones. I think my daughter will be ready for these in a few more years, but that doesn't mean I can't win them now!! If I were a "39" writer I would write something about Leonardo da Vinci; lot's of inventions and mystery there. Love the review, can't wait to read. I think Marie Curie or Thomas Edison would be good. I would write about Monet. I would write about WIlliam Shakespeare. He was such a genius and wrote so much, it would be pretty easy to find something that he wrote that could be related to the clues. Plus Amy and Dan could go to England, which is one really cool place they haven't been to yet. I was thinking that it might be interesting to include Jane Austen in the 39 Clues series. My 9 year old son loves these books and he's anxiously awaiting the publication of book #10 at the end of August. Einstein would be fun, I think. My grandson would love these books. I would feature the Wright Brothers. We love books. Especially, books with educational value. Thanks. I think I would feature Laura Ingalls Wilder in my 39 Clues book. I have always loved Laura Ingalls Wilder. So that what I would put. thanks. I love this series and can't wait for the final book to come out in a little over a week! I'd want to feature George Washington Carver. We are starting a Davy Crockett unit this week, my boys would love to see him included in an adventure! I have to say the first historical figure that came to my mind was Abraham Lincoln. I loved to play Where in The World is CS too in my younger years! I am a GFC follower - Martha E.
My 7 year old nephew reads this series, so whenever he likes a book or author he tells me and I read what he read and we have booktalk. Its one way that works and keeps him interested in reading. I would love to win the giveaway. My kids love these books! They are so excited for book 10. Please enter me. My second and fifth grader both LOVE these books. This would make an awesome addition to their book collection. I would feature a past president, George Washington or Abraham Lincoln. Betsy Ross is who i would want to feature as my historical figure. I would feature Michelangelo or Van Gogh, thanks for the chance! I've actually been reading some books like this to my kids. They would love them! They are only 6 and 7 but love adventures like these! I think Darwin would have some interesting possibilities for a story line. I've heard great reviews of the series and would love my son to get to read it.